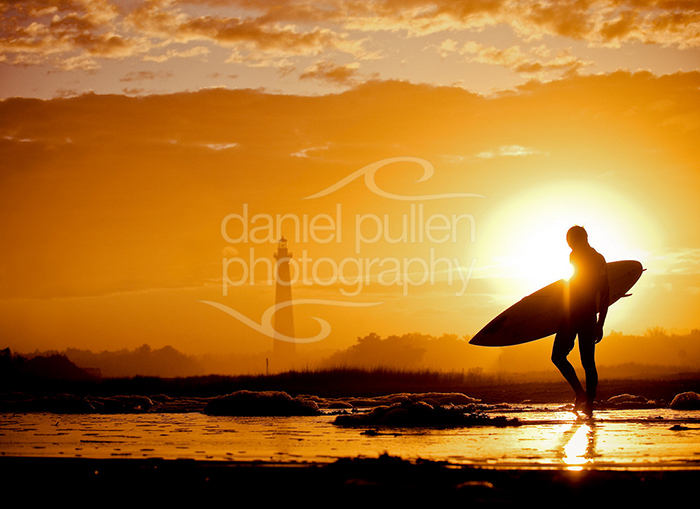 Shop Hatteras Offer: FREE shipping until December 19 when you mention Shop Hatteras! Click here to browse their virtual catalog on Facebook to see the latest and greatest of the beautiful items that are in stock and ready to ship. 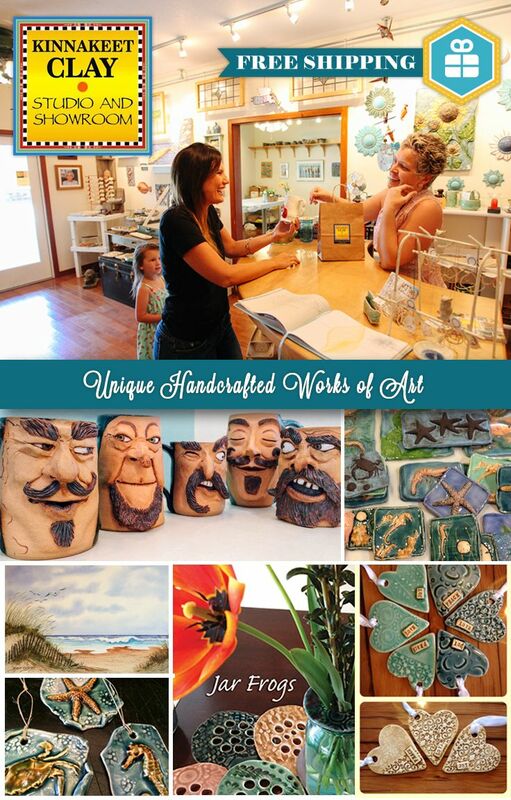 Offering beautiful, affordable, works of art – hand-crafted regionally and locally with lots of love, Kinnakeet Clay has been a favorite shop of art collectors and savvy shoppers for many years. Their online catalog is a huge hit with Holiday shoppers looking to find a unique gift for friends and loved ones. Here are ceramic artist and shop owner Antoinette Mattingly’s hand-picked favorite gifts, all handmade in-store at Kinnakeet Clay – Studio & Showroom. 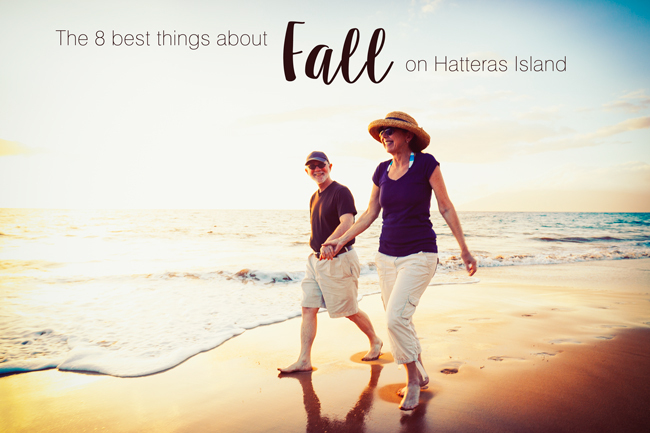 Don’t forget to mention Shop Hatteras for free shipping! Give art this holiday season! 1 – Nautical Stoneware Ornaments – These make a complete gift all by themselves or can be used as gift tags or a little extra something around the neck of a bottle of wine. Individually hand pressed using slabs of stoneware clay. These ornaments are glazed in Peacock or Mint Green glazes. Design choices include: Crab, Seahorse, Starfish, Shells & Dragonflies. 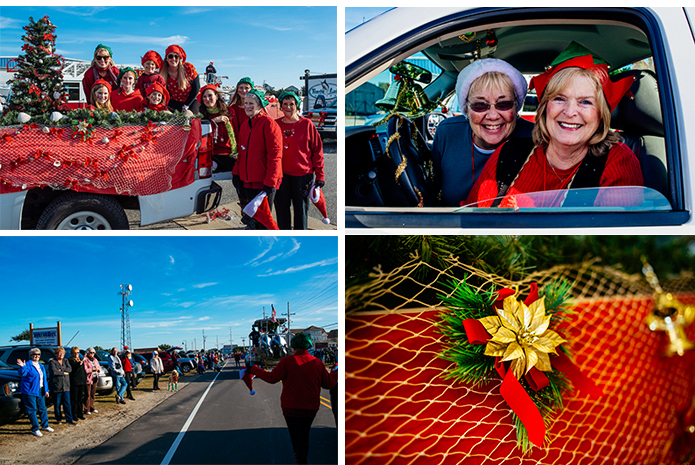 Remind those special folks on your list of their favorite Hatteras Island vacation! $12 each or 3 for $30. 2 – PEACE, LOVE & JOY Heart ornaments – Stoneware ornaments with net or vintage lace impressions and your choice of Peacock or Mint Green glaze. Wishing you Peace, Love & Joy this holiday season! $12 each or 3 for $30. 3 – Jar Frogs – What is a jar frog? So glad you asked! Simply place this stoneware jar frog atop a “regular” mouth jar and insert your fresh cut flowers. Voila! One stem or ten, you’ll create a beautiful arrangement. This is – by far – our most popular gift. Everyone loves a jar frog! $15 each. Glaze choices change often, see our Virtual Catalog for today’s options. 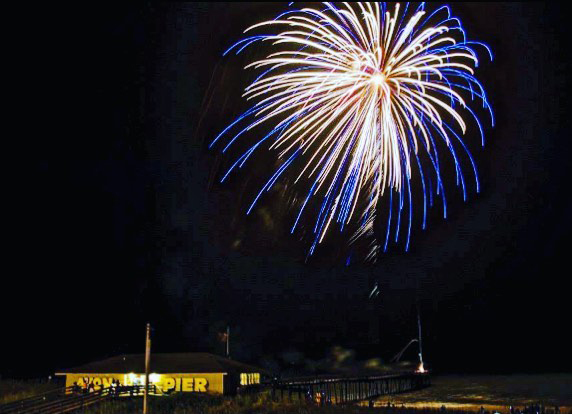 Shop Hatteras Deal – $5 OFF your $30 order at the Kitty Hawk Kites online store all the way through January 31, 2015 when you use the Coupon Code: SURFORSOUND. Kitty Hawk Kites has been teaching the world to fly for 40 years. 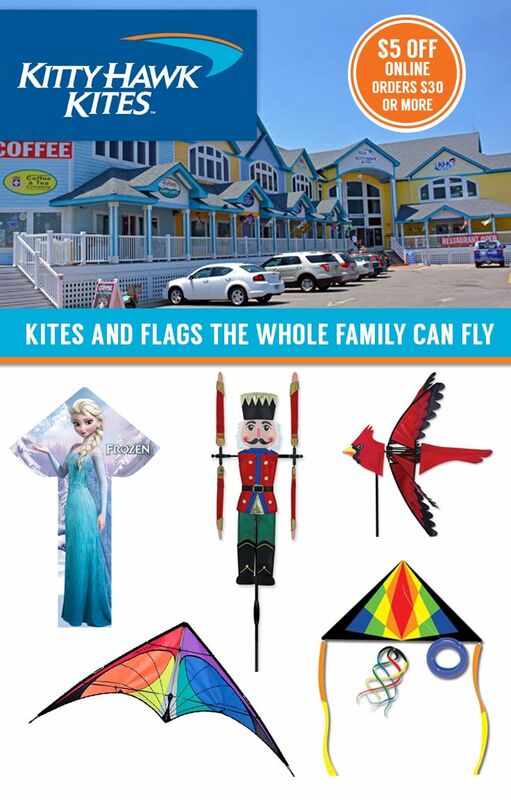 With locations in Rodanthe, Avon and Hatteras Village, Hatteras Island vacationers never have far to go to find the perfect kite. 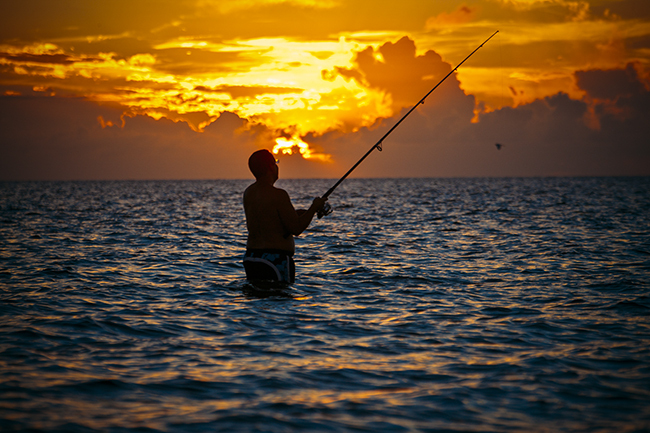 With kayak tours, jet ski rentals and kiteboarding lessons offered all summer long, there are even more reasons to visit. Check out these featured kites and wind spinners that someone on your list would love to find under the tree this year! 1 – Disney Frozen Elsa BreezyFliers Kite – This colorful nylon Frozen Elsa Kite is 57″ tall and will look awesome flying through the skies or as room decor. This single line kite is easy to fly for beginners and fun to fly for almost any age or skill level! Assembles in minutes and comes ready to fly with handle and 120′ of line included. 2 – Nutcracker 20″ Whirligig Wind Spinner – The Nutcracker Whirligig will spin its way into your heart with a flurry of color and motion. The Nutcracker 20 Inch spinner is a perfect way to accent your home, garden or business this holiday season! 3 – North American Cardinal Bird 23 Inch Wind Spinner – The Red Cardinal wind spinner will be a cheerful touch to any lawn, garden or patio. The Cardinal bird spinner’s wings rotate in the slightest of breezes while the spinner vanes with the wind. 4 – Prism Nexus Stunt Kite – The Prism Nexus Stunt kite’s dual line sport kite is tough enough for the beginner stunt kite pilot! It includes a compact carrying case, line set and wrist straps (is a great kite for traveling!). 5 – Kitty Hawk Kites Festive Sky Delta Kite Package – The Festive Sky Delta Kite Package comes complete with a stable, high-flying delta kite, a Yo Yo Winder of kite line, a Hypno Twister Tail and 2 Streamer Tails. The Festive Sky Kite Package makes a great gift for any age or skill level.